The Soviet and Belarusian historiographies study the subject of German occupation in the context of contemporary Belarus, regarded as the Byelorussian Soviet Socialist Republic (BSSR), a constituent republic of the Soviet Union in the 1941 borders as a whole. 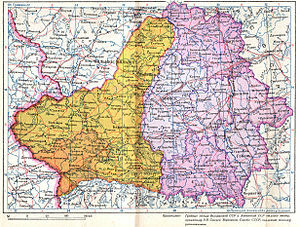 Polish historiography insists on special, even separate treatment for the East Lands of the Poland in the 1921 borders (alias "Kresy Wschodnie" alias West Belarus), which were incorporated into the BSSR after the Soviet invaded Poland on September 17, 1939. 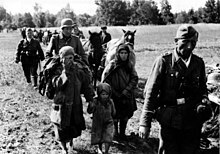 More than 100,000 people of different ethnic backgrounds, mostly Poles and Jews in West Belarus were imprisoned, executed or transported to the eastern USSR by Soviet authorities before the German invasion. The NKVD (Soviet secret police) killed more than 1,000 prisoners in June/July 1941, for example, in Chervyen, Hlybokaye and Vileyka. 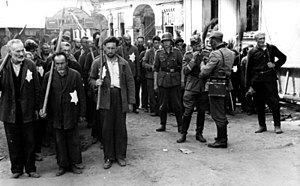 These crimes stoked anti-Communist feelings in the Belarusian population and were used by Nazi anti-Semitic propaganda. In the early days of the occupation, a powerful and increasingly well-coordinated Soviet partisan movement emerged. Hiding in the woods and swamps, the partisans inflicted heavy damage to German supply lines and communications, disrupting railway tracks, bridges, telegraph wires, attacking supply depots, fuel dumps and transports, and ambushing Axis soldiers. In the largest partisan sabotage action of the entire Second World War, the so-called Asipovichy diversion of July 30, 1943, four German trains with supplies and Tiger tanks were destroyed. 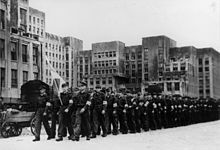 To fight partisan activity, the Germans had to withdraw considerable forces behind their front line. On June 22, 1944, the huge Soviet Strategic Offensive Operation Bagration was launched, finally regaining all of Belarus by the end of August. A 2017 study found "that Soviet partisan attacks against German personnel provoked reprisals against civilians but that attacks against railroads had the opposite effect. 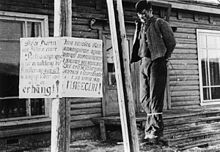 Where partisans focused on disrupting German supply lines rather than killing Germans, occupying forces conducted fewer reprisals, burned fewer houses, and killed fewer people." ^ a b c (in English) "Genocide policy". Khatyn.by. SMC "Khatyn". 2005. Retrieved August 26, 2006. ^ Zhukov, Yuri M. (January 1, 2017). "External Resources and Indiscriminate Violence: Evidence from German-Occupied Belarus". World Politics. 69 (1): 54–97. doi:10.1017/S0043887116000137. ISSN 0043-8871. This page was last edited on 31 December 2018, at 15:41 (UTC).